2015 is a very special year: The first affordable women’s nylon stockings appeared on the market in America 75 years ago. 2015 is also the year when the traditional Austrian company Wolford, whose roots are in the manufacture of luxurious legwear with exceptional comfort, will be celebrating its 65th anniversary. The day that changed women’s clothing habits for ever – both in America and, later, in the rest of the world – was 15 May 1940. It went down in history as N-day (Nylon Day): nylon stockings went on sale in New York for affordable prices – one pair cost around four dollars. Before this, the only fine stockings available were made from silk, and they were much more expensive and delicate. The new, fine and very robust material – a specific type of polyamide – was developed by the company DuPont, with the made-up name “nylon”. Nylon also had properties that were of interest to the military, however: nylon stockings became highly desirable yet hard to get hold of as soon as they were launched because the material was also used to make parachutes and tents during the war, and was therefore strictly rationed for the manufacture of stockings. The first nylon stockings were only available with a seam. It was not possible to manufacture them in any other way because there were as yet no machines available that were able to produce seamless stockings. This meant that the seam became the number-one distinguishing feature of real nylons. But that wasn’t all: the seam was – and continues to be – a way of flattering the leg by making it appear slimmer and longer. Seamless stockings only appeared on the market a few years later. But to this day, seams on stockings still play an important role in terms of fashion and are constantly being redesigned and reinterpreted. The characteristic seam also enabled women to fake the nylons look when they became severely rationed: they would use an eyeliner to draw the seam onto the backs of their legs and used make-up to create the effect of wearing nylon stockings. Soon, the cosmetics industry was offering products to meet the demand. Because the nylon in 1940 did not contain any elastic fibres such as elastane as it does today, the tights were only stretchy up to a point. They were pre-shaped and were measured to fit the inside leg so that they would fit properly. Between 1965 and 1970, nylon stockings gained competition from standard tights. Practical to wear, they assigned stockings to a new niche: They were now worn as a particularly seductive style of legwear for special occasions. The modern materials used to make stockings today have significant advantages over the rather inelastic material used in their early years: Stockings and tights not only fit better now but are also much more comfortable to wear and more robust. Some models now also feature a support effect or can shape the leg. The materials also opened up practically endless possibilities in terms of design: Today, there is a great variety of colours, designs and visual effects such as shimmering materials or appliqué. Available in delicate, natural tones that are practically invisible against the skin to opaque styles with Swarovski Elements appliqué designs – the possibilities are endless. Almost no other company has been so active in the history and development of legwear, and for so long, as Wolford – the traditional Austrian brand will be celebrating its 65th anniversary this year. 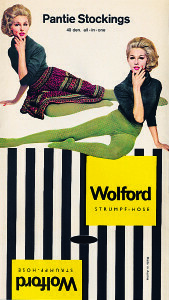 In 1949, only nine years after nylon stockings were launched as commodities, the industrialist Reinhold Wolff and retail entrepreneur Walter Palmers founded a company called Wolff & Co. KG in Bregenz on Lake Constance, that manufactures high-quality, fashionable silk and artificial silk tights. The technology is based on old American cotton gins, which were converted to comply with modern quality standards. These conversion measures served as a sort of copy protection for the products in order to secure our advantage against possible competitors right from the start. One year later, the Wolford brand was registered and went on to become a guarantee of quality recognised around the world. Right from the start, Wolford focussed on developing new products, innovative materials and the continuous expansion of its expertise in terms of knitting technology. These innovations led to the development of the first seamless nylon 6 (Perlon) tights in 1954. In 1969, the new bi-component yarn Cantrece enabled the manufacture of sheer, highly elastic tights that offered exceptional fit, which was revolutionary at the time. 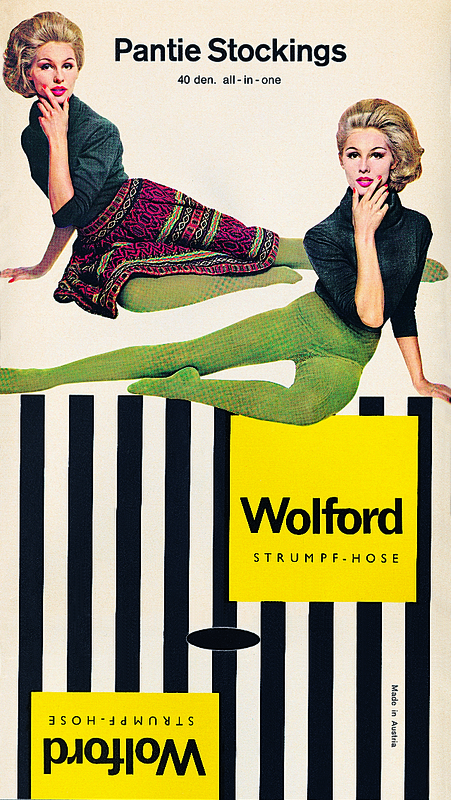 In 1962, ladder-resistant tights followed, and in 1977, “Miss Wolford Tights” – the first sheer support stockings. 1988 saw the development of Velvet de Luxe Tights, which are still a fixed part of our collection to this day: These velvety soft, matt and opaque tights are made using a special yarn manufacturing technique that is exclusive to Wolford. Countless other product developments resulting from innovative knitting or yarn/material combinations followed in subsequent years. To this day, the Research and Development department works tirelessly on new yarns and fibres, as well as on innovative knitting and coating processes. Wolford is particularly proud of the fact that its products are manufactured in Europe: most products are made at the company headquarters in Bregenz. Over 430,000 km of yarn is processed every day – and are often of our own compositions, thus uniting high-tech processing with hand-made quality. Wolford feels great in every way – both against the skin with its “unforgettable touch” and emotionally, too. From 1988, the company has been positioning its high-quality products in the affordable luxury goods category, showcasing the femininity of every woman to its most effective. Its product ranges now comprise legwear, lingerie and bodywear, clothing and accessories. In 2006 to 2008, it was partnerships with international designers such as Vivienne Westwood, Karl Lagerfeld, Emilio Pucci, Missoni, Zac Posen, Kenzo and Valentino that shaped the brand’s image and products, creating a strong emotional link that underlined their luxury positioning. The brand communication, which focussed on and continues to focus on product photography by exceptionally talented photographers, also helped to anchor the brand in the international high fashion world over the long term. The classic Image String Body and Image tights are style icons that have already made a splash in the past and have become womenswear classics. To tie in with the anniversary, we have reinvented them to give them a seductive new elegance, modern comfort and to highlight the exciting interplay of opaque and sheer fabric. The Image String Body is a classic with the wow effect: The circular-knit long-sleeved string body with an opaque front and sheer back also features a seductive central seam knitted in up the back. The bodysuit, which is made using a seamless knitting technique, looks subtly elegant during the day when worn under a jacket – and can reveal its truly glamorous side at an evening cocktail party. Image Tights are also a particularly cool companion for an extravagant look: One leg is sheer, while the other is opaque. This unusual, stylish look looks particularly effective with short dresses, trousers and skirts – making every woman a fashionista!